It seems next to impossible that the year 2007 came to a close yesterday. I know I'm not alone in pondering where the year vanished to, how quickly it dispersed seemingly without leaving a trace, or how unlikely it seems that we should be inching closer to this new century's second decade! I should no longer remain shocked when it's time to add a single digit to the end of the year, but I always feel caught off guard, astonished at how quickly the time passed. To make an all-too convenient analogy, I feel a bit like Octavian wanting desperately to cling to what he knows, unable to grasp the need to change, mixed with the Marschallin endeavoring to stop those insistent hands of time from purging forward. Oh, I don't mean to sound too melodramatic or distraught here - not at all, it's simply that I would prefer to receive the equivalent of a 'get out of jail free' card, only along the lines of 'get one free week to process your life' pass, then I would happily, eagerly, even enthusiastically, jump into '08 with gusto and not a look back. Why does this year feel a bit heavier than usual to process and catalogue? I suppose it's simply because of the sheer magnitude of change which presented itself to me, combined with the enormous volume of work. Even as I type this, it is dawning on me that 2007 was a truly pivotal year - how it plays out over the course of my life remains to be seen, but there is no doubt that it will be personally, and even perhaps professionally, monumental. From a purely business standpoint, how could I argue with the past 365 days? I started what will hopefully be a long and rewarding journey with some of the premiere operatic roles: Octavian, Ariodante, and Alcina. Each one proved to be an immense lesson about my craft simply from tackling such demanding masterpieces, about artistic integrity from the exemplary work of my colleagues, and about the kind of work I want to do as an artist - but more on that later. I feel so enriched from these professional experiences, and while they left me quite drained, the amount of energy and insight I gained from plunging full force into them was worth every moment. 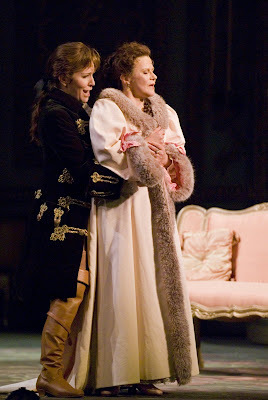 I also had the joy of returning to two roles that have served me quite well: Rosina and Cenerentola. Returning to these effervescent characters shows me the value of role repetition, serving as a guidepost for how much work goes into getting a role ready to debut. In some ways it feels as if this was the year of my 'arrival' in New York, if it's necessary to flag that sort of event. Taking part in Peter Gelb's innovative and colossal project of bringing live opera into cinemas across the world, and therefore, astoundingly into the popular culture - a venture that no one in their right mind would have conceived of as feasible a year ago - proved to be an undeniable high point of my career to date. I only give it such importance because I continue to hear from people who tell me what a memorable experience it was, and how it has single-handedly changed their perception of opera. I think those of us that love this craft so much have always believed in the power of opera to captivate and on occasion, truly move people in significant ways, and I'm certain that this new venture of the MET's will go miles and miles to make that possible. Capping off my time in New York was an encounter that I never could have predicted would have taken on such importance, for I was most fortunate to meet Beverly Sills before the world lost her - one of the pillars and true champions of the American cultural scene. I wish I had more time and opportunity to soak up each of her countless pearls of wisdom, but I will happily take the little time I did have with her, turning to her example of enthusiastic dedication as a role model in using your gifts to, dare I say it, better the world. Speaking of National Geographic, there is no denying that the highlight of my year was our adventure to South Africa. In scoping out the itinerary, I really had no clue what a life changing experience it would be for me, in the sense of seeing the 'real world' in action, of getting a severe 'reality check', and simply being reminded one more welcome time that balance is essential to all that we do. Nature has a way of driving home that point loud and clear, and in the end nature always wins. Any time we upset the natural balance of things, whether on the stage, in our homes, in our hearts or heads, nature is there to provide the needed check and balance. That has been my food for thought ever since stepping foot in that beautiful country, and I truly cannot wait to return. The final piece of the puzzle of 2007 for me, was the loss of my Mom, compounded by being so close in time to my Dad's passing. Looking back, it seems as if they went out side by side, hand in hand with no time lapse at all - but then I remember the painful, difficult 6 months my Mom spent missing my Dad after he was gone. The last time she saw me perform was at the Cinemark movie theater in Lenexa - and truth be told, that's the reason that event will be a highlight in my life - not because of the professional gains. That was my Mom's chance to shine and revel in the experience of seeing one of her children shine in something they love to do. Countless friends told me at her funeral, just a month after the broadcast, that their last image of my Mom was seeing her cheering with her arms waving over her head, saying, "That's my daughter." I wish I could have been there to see that, but I can only hope that she knew that her influence on my life was one of the singular reasons I was standing on that stage that day, and the applause belonged to her. While I know it's not the nature of things, I do wish that time could stand still every now and again. What I wouldn't give to see my Dad and Mom standing at their front door waving hello with open arms after a long stay on the road, eager to hear about all the adventure. Even though I love being a world traveller, independent from a very early age, how much I wish that I could ring their doorbell and know that I was home. What I wouldn't give to hear my Dad's voice one more time providing comfort as only he could give, providing guidance and assurance along with the perfect dose of humor. But time marches on and nature stubbornly stakes its claim on the natural rhythm of things. We seven children all had to say goodbye to our childhood home and carry on without having a clue as to what would come next, or how in the world we could stand with the ground shaken so terribly underneath our tentative feet. I don't profess to know how singing opera ultimately figures into the scheme of things; I still get very upset when a colleague's last thought in the world is generosity or sincerity; I don't begin to pretend that I understand what makes one singer a star, and another disposable; but I'm not sure these are answers I need to find just yet. 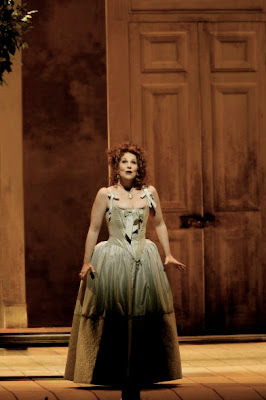 2008 will mark the start of my 10th year as a professional opera singer. Could I have predicted ANY of this? Not a chance in hell. But I'm finding my own voice throughout this journey, and while searching for closure is inevitable at this time of year, at the end of this ENORMOUSLY LONG ENTRY, I find that I'm happily looking forward and thrilled at what lies ahead. And in a final (I swear!) wish for a beautiful New Year in 2008, here's something to start the year off with a perfect, infectious, spontaneous and GIDDY smile - I dare you not to love it! Just think how wonderful (the leap-year) 2008 will be; I mean you'll have a whole extra day to either fill with adventure, or camera-wielding, or perhaps could justify a whole day in bed sometime during the year! Thank you for this video ... and for your wonderful blog! 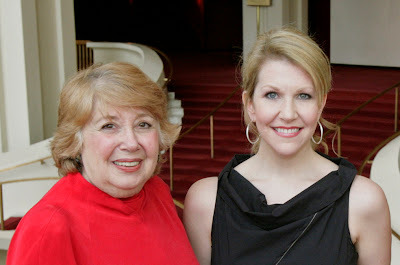 I had the wonderful privilege of hearing and seeing you in the SF opera production of Der Rosenkavalier. Brava ... incredible performance!